405 Commonwealth is located on the north side of Commonwealth, between Massachusetts Avenue and Charlesgate East, with 403 Commonwealth to the east and 407 Commonwealth to the west. 405 Commonwealth was designed by architect James T. Kelley and built in 1900-1901 by Stephen Brennan, mason, for attorney Loren Griswold DuBois and his wife, Mary Hurlbut (Miles) DuBois. He is shown as the owner on the original building permit application, dated August 13, 1900. 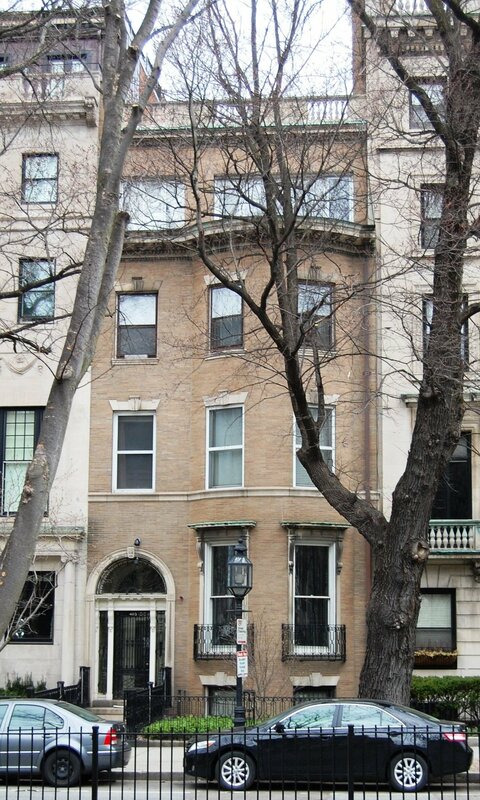 In his Houses of Boston’s Back Bay, Bainbridge Bunting attributes 405 Commonwealth to architect Samuel D. Kelley. This is not correct. The original building permit application clearly indicates that the architect was James T. Kelley of 57 Mt. Vernon Street (where James Templeton Kelley lived and maintained his office at that time). 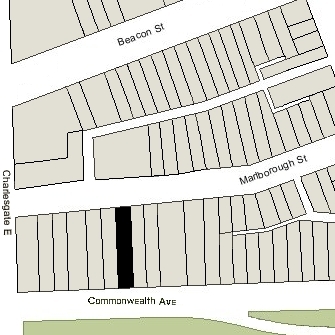 The rear of the lot on which 405 Commonwealth was built extends north to Marlborough Street and has a secondary street address of 454 Marlborough. Mary DuBois purchased the land for 405 Commonwealth on March 24, 1900, from John Malcolm Forbes, part of a 104.77 foot lot at 403-409 Commonwealth. J. Malcolm Forbes had acquired the lot on February 19, 1887, from Louis Curtis, who had purchased it on January 8, 1886, from a real estate investment trust formed by Francis A. Palfrey, Francis A. Osborn, and Grenville T. W. Braman. The lot was part of a tract of land the trust had purchased on June 1, 1880, from the Boston Water Power Company. Click here for an index to the deeds for 405 Commonwealth, and click here for further information on the land west of Massachusetts Avenue between the south side of Beacon and the north side of Commonwealth. 403 Commonwealth and 407 Commonwealth were built after 405 Commonwealth, and both had windows in the party walls, both with shutters which opened over 405 Commonwealth. 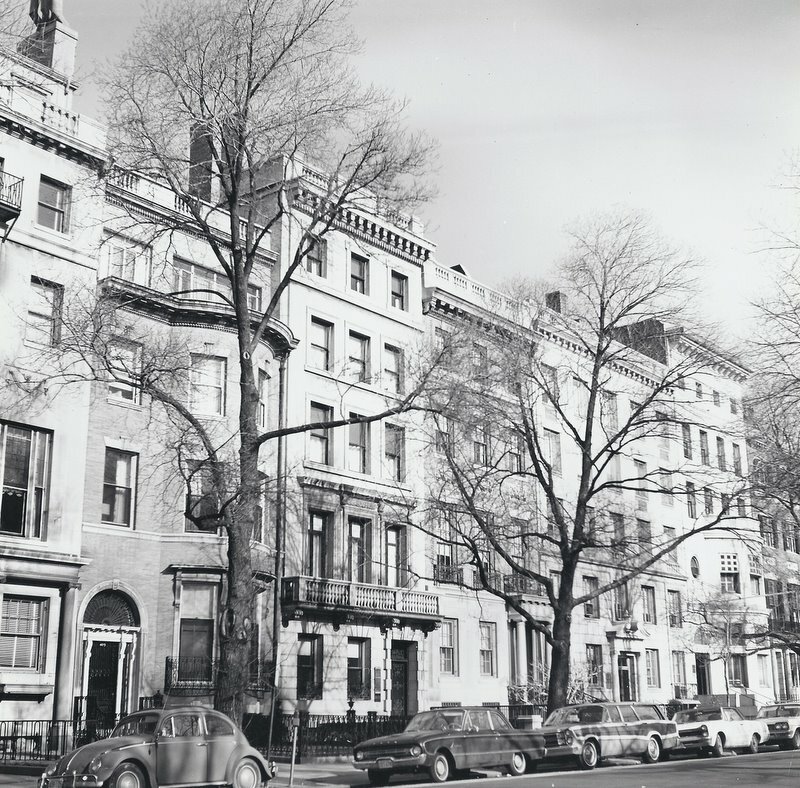 In November and December of 1901, Mary DuBois entered into agreements with Louise Amory, owner of 407 Commonwealth and Samuel Carr, owner of 403 Commonwealth, specifying that the owners of 403 Commonwealth and 407 Commonwealth were to remove the windows and shutters if requested at any time by the owner of 405 Commonwealth. By the 1901-1902 winter season, Loren and Mary (Miles) DuBois had made 405 Commonwealth their home. They previously had lived at 298 Marlborough. Loren DuBois died in January of 1919. 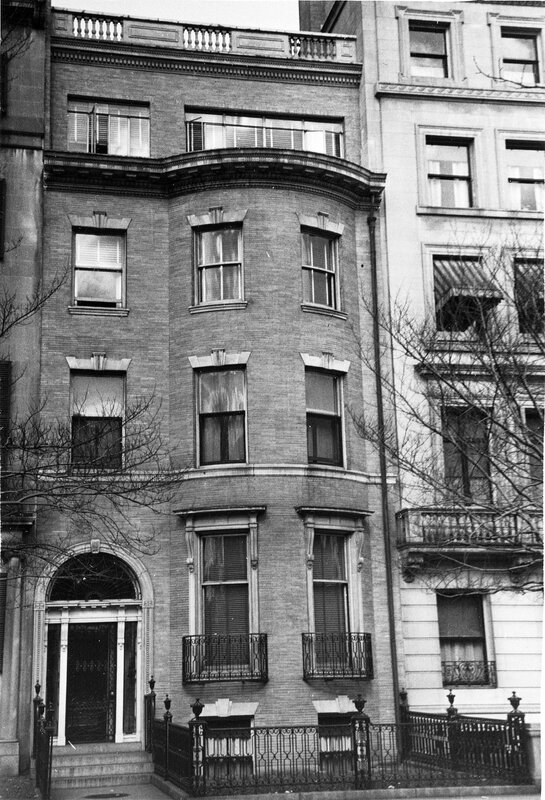 Mary DuBois continued to live at 405 Commonwealth until her death in October of 1935. On October 8, 1937, 405 Commonwealth was purchased from Mary DuBois’s estate by Josephine Jenison Wardrobe of Medford. She was a legal secretary and probably held the property on behalf of someone else. That same month, she filed for permission to convert 405 Commonwealth from a single-famly dwelling into ten apartments. She subsequently abandoned the permit, but in October of 1938, she again filed for (and subsequently received) permission to convert the house into ten apartments. On March 6, 1940, 405 Commonwealth was acquired from Josephine Wardrobe by Adams Apartments Inc.
On July 15, 1949, 405 Commonwealth was acquired from Adams Apartments, Inc. (Samuel H. Wragg, president) by James Bernard Regan and Susan (Susanna) M. Cassidy Regan. They lived at 424 Beacon, where they operated a lodging house. On September 22, 1950, 405 Commonwealth was acquired from the Regans by Maurice M. Galer. He was a beverage manufacturer and later a real estate dealer in partnership with his sons, Lawrence Irwin Galer and Michael Master Galer. Maurice Galer died in January of 1968. 405 Commonwealth became the property of the Maurice Galer Trust, which he had established on January 16, 1965, with Lawrence Galer, Michael Galer, and Leo Dunn as trustees. On August 13, 1976, 405 Commonwealth was acquired from the Maurice Galer Trust by Marvin M. Glick, trustee of the 405 Realty Trust. 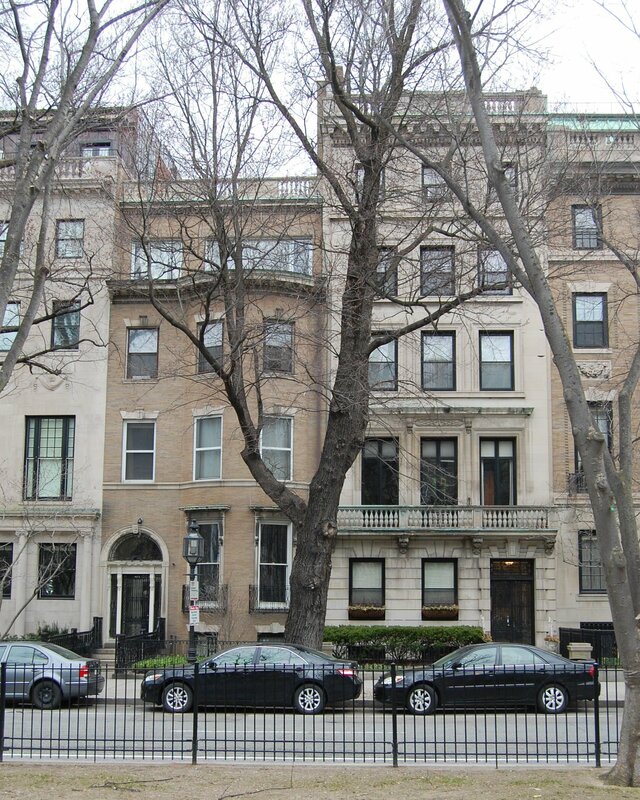 On November 23, 1979, 405 Commonwealth was purchased from Marvin Glick by the Back Bay Condominium Corporation. Marvin Glick was the president and treasurer of the corporation. That same day, it converted the property into ten condominium units, the 405 Commonwealth Condominium.